Although it’s been quiet here on the blog it’s been crazy busy around our house recently. I’ve got multiple events going on at work, we’re preparing for the holidays, everyone wants family photos for their holiday cards and I’ve been crafting up inventory for a holiday bazaar this weekend. 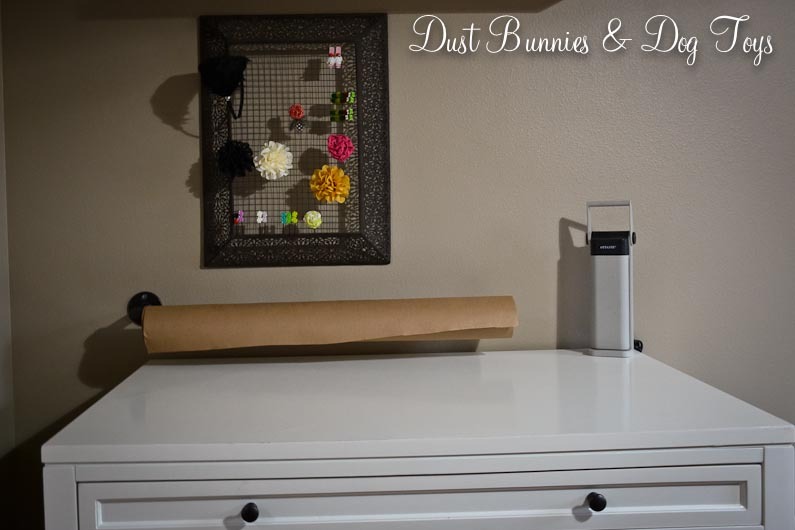 I’ll be sharing some of those projects once I have time to take photos and do some writing, but in the meantime I wanted to share a little project the hubs did for me recently. 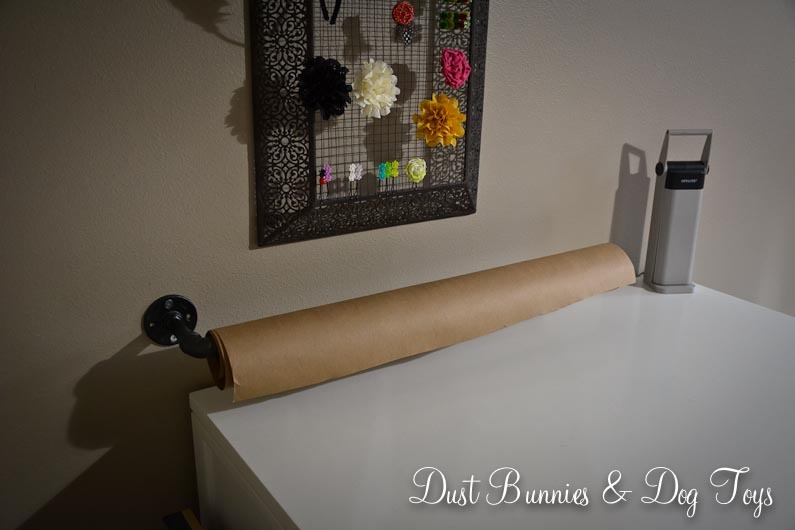 I keep a roll of craft paper around for projects and wrapping, so I wanted an efficient way to store it yet have it at the ready when needed. 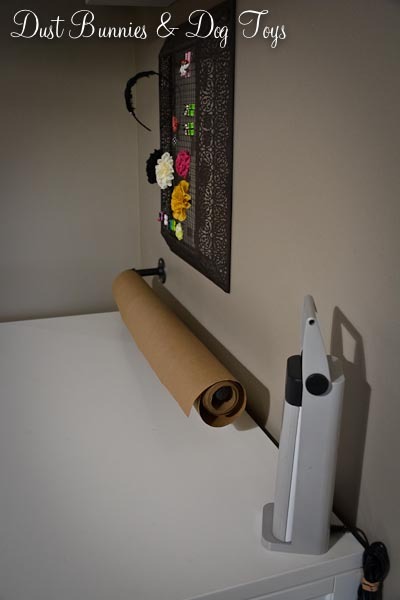 The solution was a simple metal bar mounted just above the craft cart which can hold the roll. It consists of a flange, a short piece of pipe, a 90 degree elbow, a length of pipe and a finishing cap. The hubs put it all together and located a stud to secure it to so it’s super sturdy. Although I’d envisioned it positioned in the center of the cart, having it off to one side actually works because it provides a spot for my task light. Today I thought I’d share a simple centerpiece I created for a recent work event. I wanted something fall themed for this particular event, but hoped the elements I chose would pull double duty for our upcoming holiday party so it needed to be able to transition into winter. The venue provided the silver lanterns, so I added a birch round, pinecone, pheasant feather and mini pumpkin to compliment. Some of the birch pieces were thicker than others so I set the lantern next to the birch for those so they didn’t impede the view of the presentation being given. We also had some small signs on the tables with factoids about the subject matter, which we put in small silver place card holders. Although I can’t share the factoids, here’s a blank card to give you an idea of how they fit in with the centerpieces. 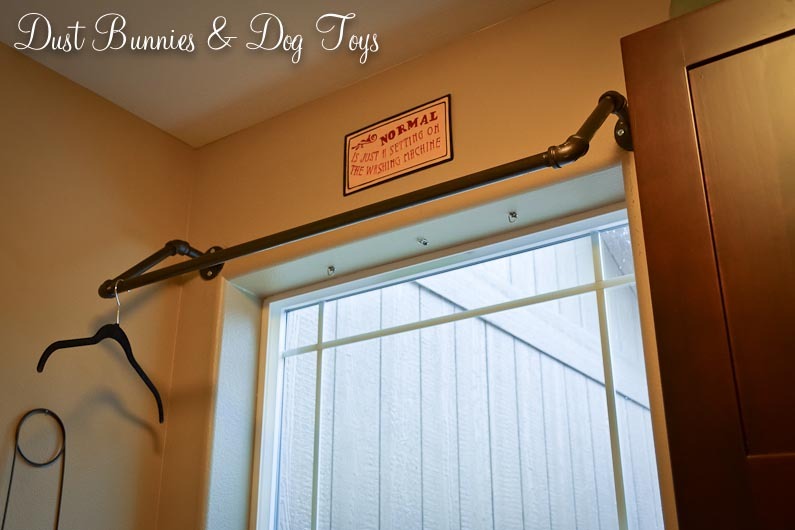 Today I’m sharing another industrial pipe project the hubs recently did for me – a dry rack in the laundry room. 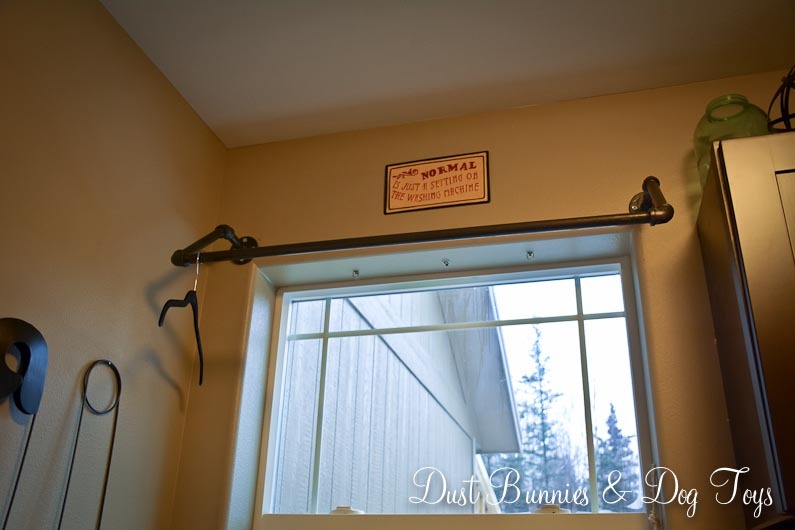 I often have sweaters and tops that need to be dried flat, but since I don’t have a space to do that I usually hang those items on a folding dry rack over a vent in the adjacent dining room. 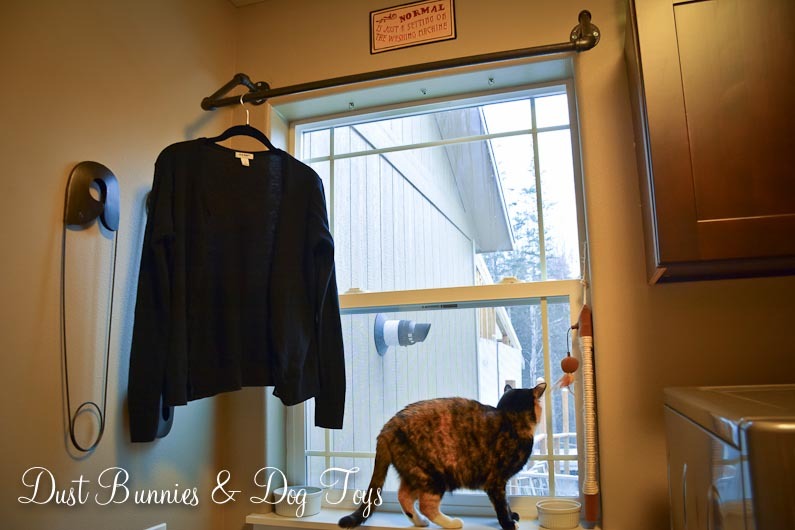 Unfortunately the hubs like his jeans to air dry and are often occupying the folding rack when I need to dry sweaters so my solution was a permanent rack in the laundry room over the sink. I originally asked for a bar straight across but the hubs determined that in order to get the best stability we’d have to place the bar higher than I originally thought so he created a small drop down in the design to compensate for the higher spot. Luckily, I’m pretty tall and can reach the hanger up to catch the rod with the hook easily, so the height is no problem for me. Shared on Knick of Time’s Vintage Inspiration Party! 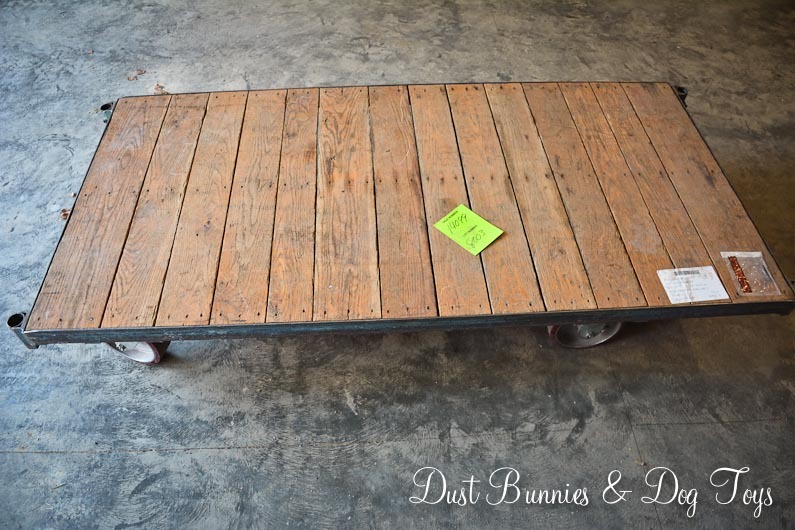 Remember this cool metal cart I shared last month? Well the hubs has worked his magic and converted it to the coolest bed for our foster room! I don’t have step-by-step instructions since he worked on this while I was working on other projects, but you can see the basic design in the picture below. 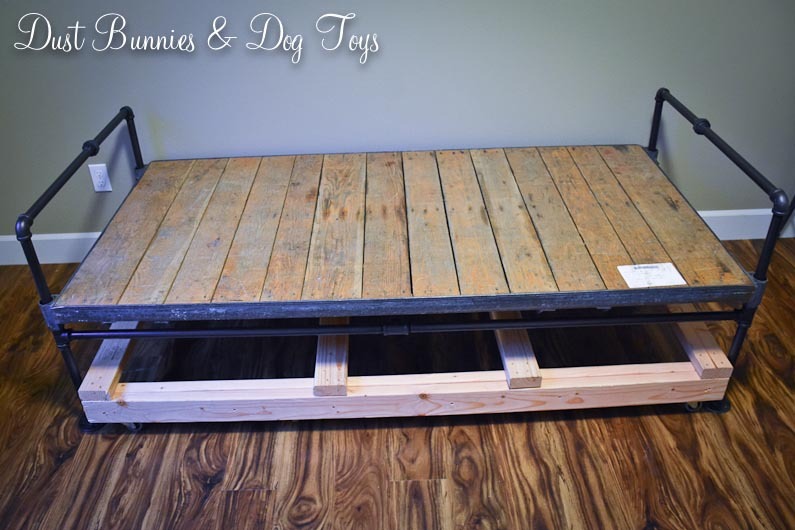 He also built a trundle frame based on a plan I found on Pinterest that rolls right underneath so we have the ability to take in siblings if needed. 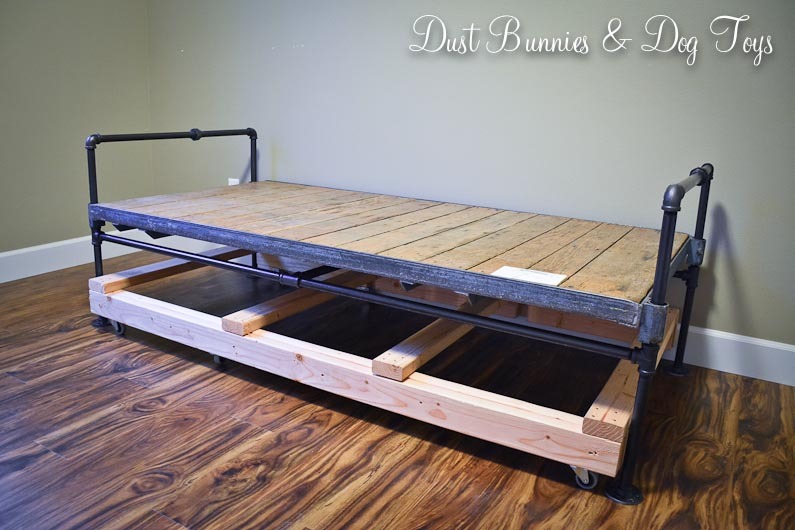 Both the trundle and the bed are super sturdy so there’s no worries about having a kiddo and all of the dogs on there together, which I can envision happening. Here it is all dressed! 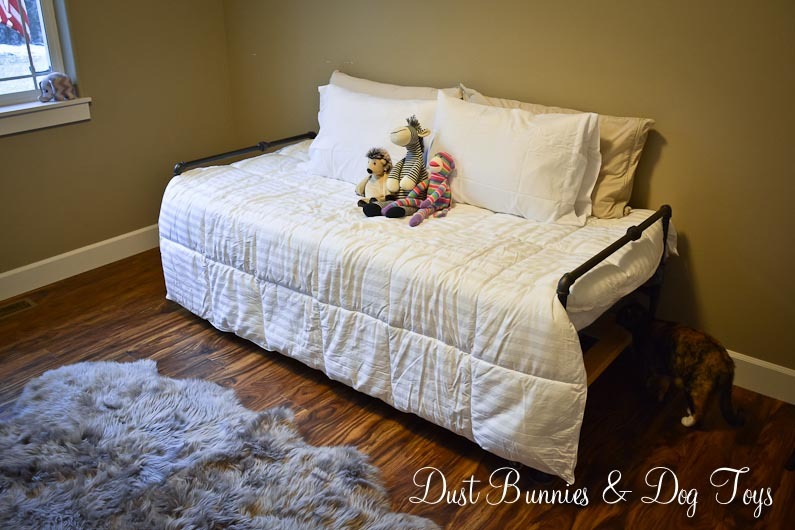 And because we went with a simple day bed style it should be simple and easy to teach kids how to make the bed and keep things tidy. It’s also a great new place for Luna to explore as you see below. We still need to get a mattress for the trundle frame and figure out a desk and nightstand for either side of the bed, but I think this room is finally starting to come together! 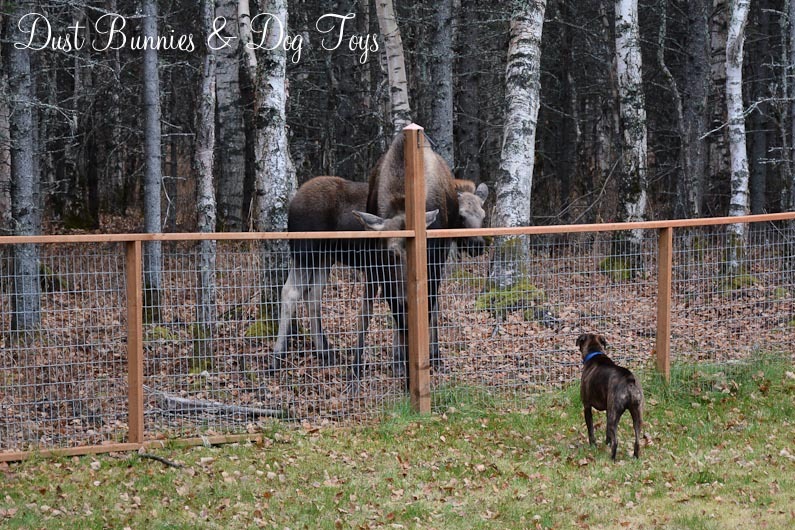 Don’t Mess with Momma Moose! 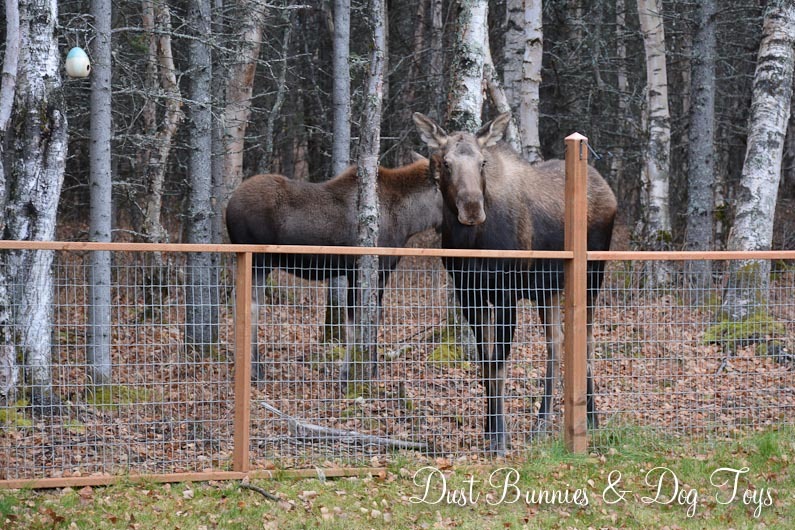 In the meantime, today I thought I’d share a little encounter we had with the neighborhood moose recently. The hubs was off and had been home all day, but I had just gotten home from work. 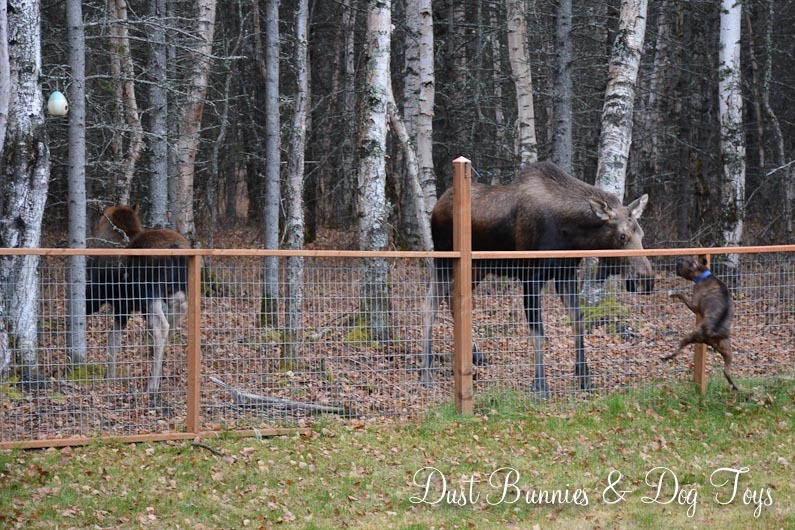 He told me that a momma moose and yearling had been hanging out around the back yard on and off during the afternoon and as I looked outside I saw they had returned so I grabbed my camera and stepped out on the back deck to get a few shots. 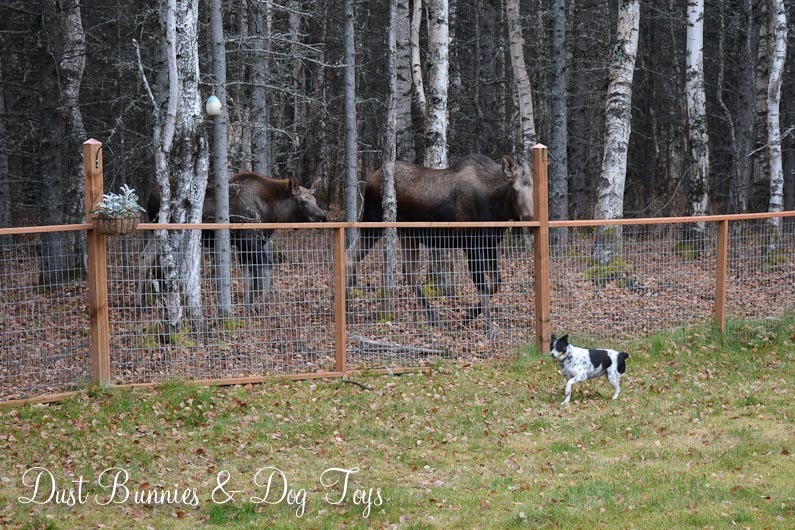 Now that I was outside, the dogs became fairly determined to let the moose know they were on guard duty. 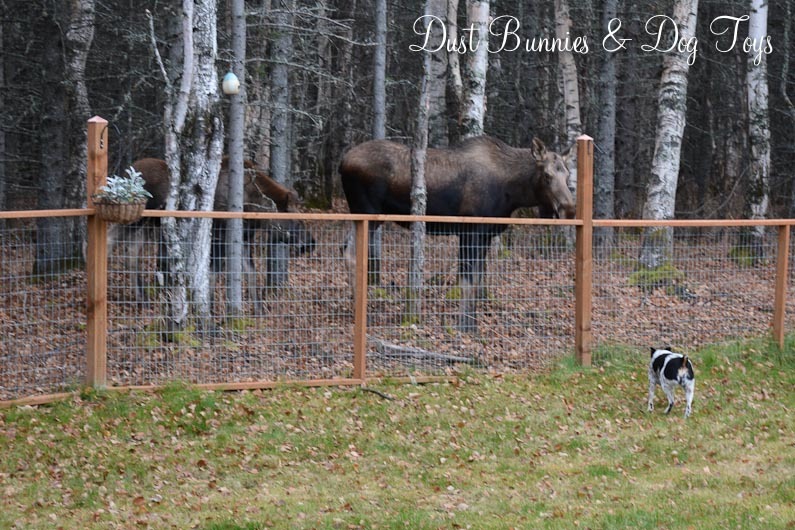 She wasn’t impressed and stood her ground on the back side of the fence. When Stoli attempted to show some dominance by jumping and barking, she gave him a big snort and stomp as a warning, which he obviously ignored. 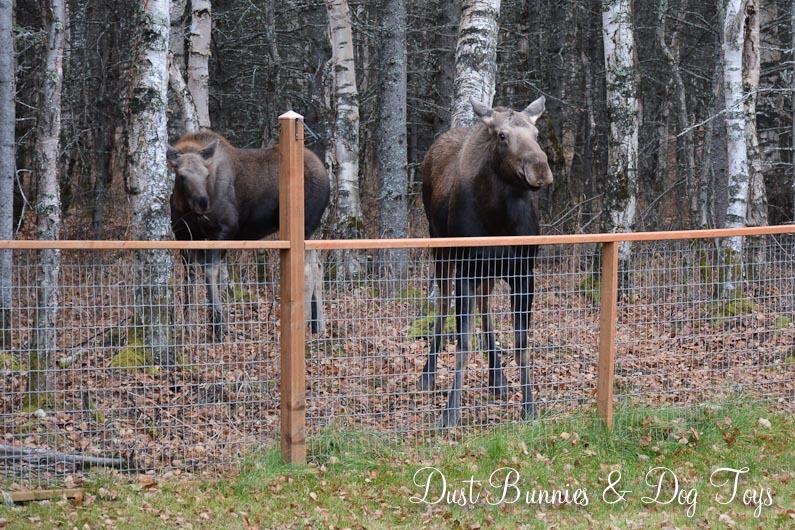 Seeing that momma moose was agitated we commanded him to leave the fence and come back inside, which took several attempts because he wasn’t happy about leaving a threat near his turf unattended. That was when Bacardi decided it was her turn on guard duty and started to patrol the perimeter. Momma moose took one step and Bacardi quickly realized she was no match, and she came running back inside before we even had a chance to give her a command. Smart girl! Momma moose continued to stand her ground for quite a while with occasional snorts in our direction, but eventually wandered off into the woods to find a quieter location to forage.